All Posts Tagged With: "Pressed Powder"
CHANEL Celebrity Makeup Artist Angela Levin worked with Jennifer Aniston at the New York premiere of The Bounty Hunter on Tuesday, March 16th, 2010. “I prepped Jen’s skin with CHANEL Sublimage Serum. Then, as I base I used CHANEL Mat Lumiere Fluid Makeup in Natural all over the face, with a bit of the CHANEL Natural Finish Pressed Powder in Clair. For the eyes, concealer, and cheeks, I used a fabulous new palette – Collection Essentielle de CHANEL Multi-Use Make-Up Palette in Paris-New York. 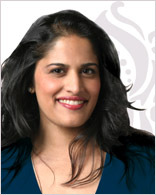 Thevi Cosmetics was founded by wife, mother and entrepreneur, Thevaki Thambirajah. Thevi Cosmetics founder Thevaki Thambirajah. With roots that reach deep into the Indian sub-continent, Thevi was born of Sri Lankan parents in New York State. As a young woman, beginning her career and enjoying a busy social life, Thevi could never find cosmetics in shades that suited her coloring. She felt a keen need for a prestige makeup brand with colors that were rich and vibrant without being harsh, and Thevi Cosmetics was born. Thevi represents the New Ethnic Market: light-to-dark skinned woman of Asian, South Asian, Hispanic, Middle Eastern, and Mediterranean descent. And we think it’s brilliant! Because finding the right shade of foundation is a key to a flawless face. There is still a room for expanding the makeup color scheme, and thanks for visionaries like Thevaki Thambirajah for making it happen. Talking Makeup tried few of Thevi products and we are impressed. The quality of ingredients is definitely there. Mineral Pressed Powder SPF 8, $30. Liquid Powder Mineral Foundation SPF 15, $32. Automatic Longlasting Lipliner (my favorite is in Heather, and I added it to my makeup bag), $16.50.